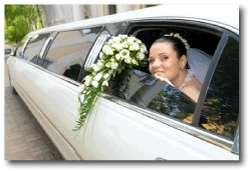 Answers for Wedding Limo Service Questions. When a couple decided to get married, there are so many details that need to be planned in order to make their wedding a special event. One of the major factors involved in planning a wedding is the wedding transportation. A wedding begins with a proposal and a nice limo ride with a proposal in the back is always considered romantic. Then there are the stags and bachelor parties which would help to keep everyone safe with a limousine rental for the night. No one would have to worry about who is the designated driver, getting gas or getting lost. 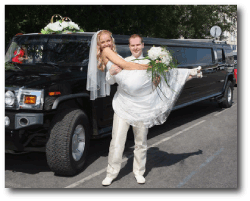 Many couples wonder how far in advance they should book their wedding limousine. The answer is typically six months before date for the wedding. A lot of weddings happen on the same date and so in order to reserve a wedding limo, or several rides for the wedding party, it is important to let the limousine company know as soon as possible what date a wedding is planned for. There are many different types of wedding limousines available for the happy couples special day. For a more old-fashioned wedding celebration, there are older looking limos, reminiscent of the 50's and 60's. And for those who like to party, there are party limos with lots of different lighting, a bar, couch seating and several large, flat screen televisions that capture all the action of a game or show that couple may be missing on their big day. There are also traditional stretch limos and the extra large Hummer Limos that will seat up to 20 people, enough for everyone in the wedding party to ride together. Many couples prefer a summer wedding because sometimes the colder weather may not lend itself to all the activities surrounding a day of celebration for the happy couple such as pictures in the park or a ride around town. For summer weddings, there could be a fee of up to $100 for rental of the park spaces for photographs. A bride, groom or wedding planner would need to check on this before the big day and notify the limo service company for further arrangements. If a couple is on a tight budget, they may want to think about a winter wedding. Winter weddings are considered out of season weddings and could garner 25% off the price of a day's rental. The bride or groom would have to call with a specific date they have in mind to get all the detail. Yet another stop on the winter wedding agenda that has become very popular is the various gardens and greenhouses for fantastic photo opportunities. Another way to save up to 25% off the rental price of a limo would be to schedule a wedding on a Friday or Sunday. These are also thought of as 'off' days because everyone likes to be married on Saturday's. But if a couple needs to conserve their funds, cutting the price of the wedding limo by holding the ceremony on a day other than Saturday is a good idea.